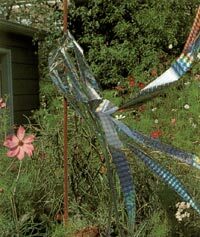 Irri-Tape iridescent foil combines holography, wind and light, to irritate pest birds' senses and create an "off limits" zone against them. We started with a proven idea - the scarecrow. Then we applied Space Age technology and materials to produce a new wrinkle on that age-old concept. The result is a lightweight, durable, maintenance-free bird repelling product, so versatile it keeps suggesting new and effective applications. Irri-Tape is a Visual Bird Deterrent. It "flashes" as it moves with the wind. Reflecting sunlight, or any light, it produces constantly changing colors and patterns. This brilliant, flashing "ripple effect" is picked up by the bird pests as an unsettling danger signal. Whether seen as a predator (from a distance Irri-Tape has a reptilian sheen) or a rival for food or space, birds will not ignore this potential menace. Irri-Tape's properties keep unwanted bird pests away in several ways. Pest birds are "rattled" by the fierce metallic noise the material gives off when caught by the slightest breeze. Physical Barrier Applied along a ledge, fence or other narrow surface Irri-Tape prevents access to birds' "landing strips." Install wherever there is a bird infestation. Wind and light will do the rest. For open outdoor areas - "maypole" six to ten eight-foot lengths of Irri-Tape by tying them to the top of any upright post. For farms or gardens - Irri-Tape has many applications for protecting crops from bird damage. Spiral it around free standing trees from top to bottom. Or suspend it over vines and around row plantings. Entire garden areas may be protected by hanging Irri-Tape from 6' to 8' poles to form high row deterrents. Other applications will keep ducks and geese off of lawns and ponds where they aren't wanted, or keep predator bird pests away from fish farm ponds.